3 Day Master Class with Alan Williams. Discover the techniques of the Master and put them into practice. Alan will guide you through the techniques needed to create his signature piece, the Nautilus Shell. You will learn tips and tricks on bandsaw use, "reading" timber, the bandsaw box making process, carving and finishing. This workshop is strictly limited to 6 participants. 14th, 15th, 16th June 2019. I met Alan Williams briefly at a Woodworking show where he was demonstrating his bandsaw box techniques and I was instantly captivated watching a true master at work. So when I was told by his colleague Peter, that Alan ran some 3-day workshops teaching these techniques I couldn’t resist. I arrived for the workshop interested and keen to learn, but not really knowing what to expect. I left three days later feeling that I had just had the most wonderful experience imaginable. The workshop setting, at Artisan’s on the Hill near Taree, is just perfect - a little slice of rural heaven. The (optional) live-in accommodation is clean and comfortable, and hosts Peter and Christine went out of their way to make me feel at home. The workshop itself is extremely well-structured and the pace “just right”. The mix of demonstration, question and answer, and hands-on doing meant that we applied what we learned straight away - in fact, we all left the workshop with three pieces of our own at varying stages of "finished". And with a limit of just six students, Alan was readily available to each of us when we needed an extra guiding hand. I cannot say enough about Alan’s teaching - he is a master craftsmen who clearly takes genuine pleasure in passing on his knowledge and skills, no matter your previous level of experience. 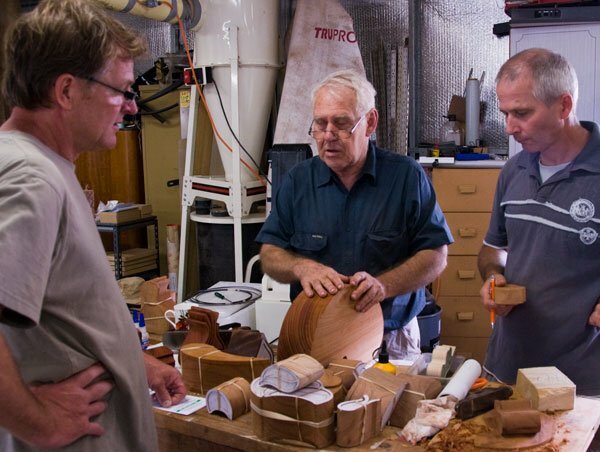 He is a walking encyclopaedia of woodwork, and yet a humble and gracious man to the core. He really is a National Treasure. If you are thinking about attending one of Alan’s workshop, then stop thinking and just do it - you won’t regret it!